“Money Monster” (2016). Cast: George Clooney, Julia Roberts, Jack O’Connell, Dominic West, Caitriona Balfe, Giancarlo Esposito, Christopher Denham, Lenny Venito, Dennis Boutsikaris, Emily Meade, Condola Rashad, Aaron Yoo, Carsey Walker Jr., Greta Lee, Makhaola Ndebele, Darri Ingolfsson. Director: Jodie Foster. Screenplay: Jamie Linden, Alan DiFiore and Jim Kouf. Story: Alan DiFiore and Jim Kouf. Web site. Trailer. As host of the Financial News Network’s Money Monster, Lee Gates (George Clooney) presides over the cable channel’s hottest program. With his singular flair and outlandish showmanship, Gates serves up a daily digest of financial news and stock tips, punctuated by comical sound effects, old movie clips and even an opening dance number, a somewhat exaggerated take on shows like CNBC’s Mad Money. His colorful, high-energy on-screen presence makes him an audience favorite, though his inclinations for ad libs and confrontation frequently try the patience of his producer, Patty Fenn (Julia Roberts), a no-nonsense professional who toils to keep her star in check – and the show on the rails. 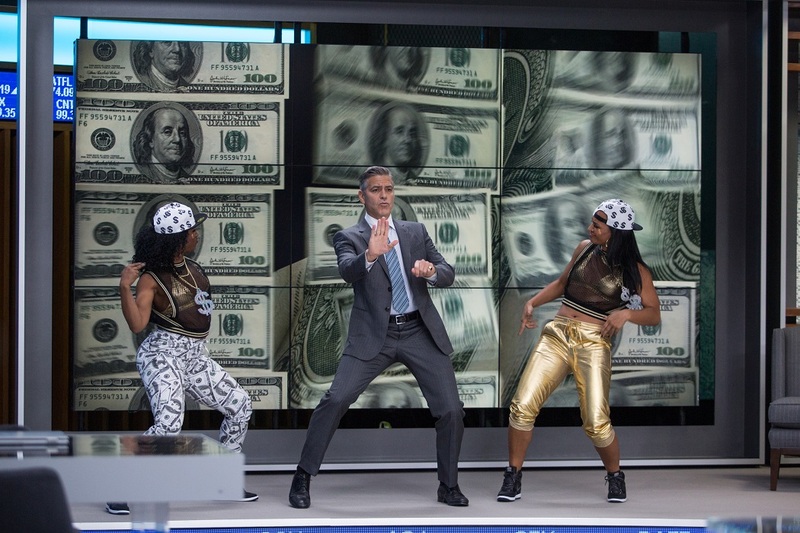 Lee Gates (George Clooney) hosts the colorful financial news show Money Monster in director Jodie Foster’s gripping new thriller, “Money Monster.” Photo by Atsushi Nishijima, courtesy © 2016 CTMG, Inc.  When one of Gates’s stock tips, Ibis Clear Capital, suddenly goes bust, he decides to address the issue on air in an interview with the company’s founder, Walt Camby (Dominic West). But, at the last minute, Camby is nowhere to be found. 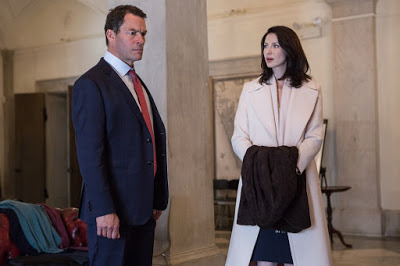 His unexplained disappearance raises some eyebrows and necessitates the implementation of a backup plan, an interview with Ibis’s chief communications officer, Diane Lester (Caitriona Balfe). This makeshift solution is far from ideal, but, as events unfold, it will turn out to be the least of the show staff’s worries. Not long after the broadcast begins, trouble breaks out. A disgruntled Ibis investor, Kyle Budwell (Jack O’Connell), sneaks onto the set, armed to the teeth. With gun in hand, he takes Gates hostage on air, holding him and Camby responsible for the loss of his $60,000 investment, all of the money he had. And, to show everyone he means business, Budwell forces Gates to don a vest fitted with a bomb and demands to speak with Camby, for whom he has a vest of his own all prepared. He wants reimbursement and apologies for his loss, threatening dire consequences for their failure to comply. Gates, needless to say, is stunned but struggles to keep calm, thanks in large part to Fenn’s composure to hold it all together. Much of the production staff is evacuated from the studio, and crisis management personnel from the police and Ibis corporate move in to address the situation. And, almost instantaneously, the story blows up into a worldwide phenomenon, with networks around the globe picking up FNN’s live feed. Audiences are captivated as they watch the drama play out, live on the air. 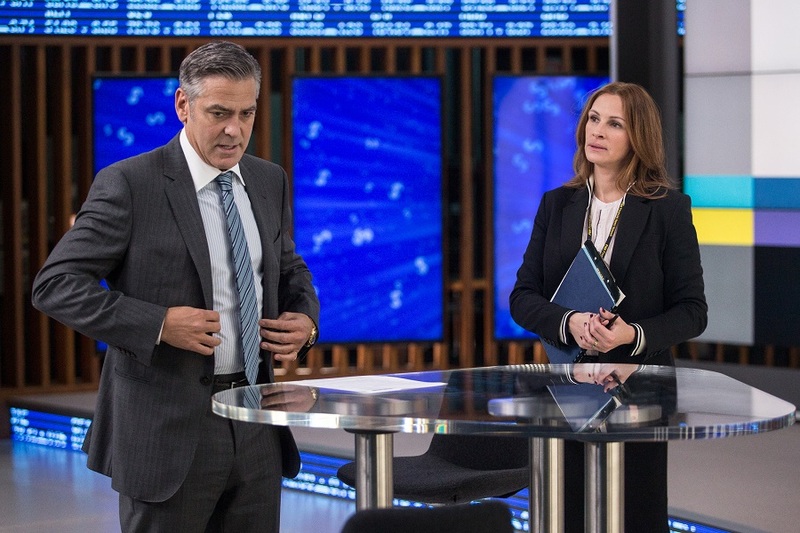 Host Lee Gates (George Clooney, left) and producer Patty Fenn (Julia Roberts, right) frequently disagree on their approaches to the hit financial news show Money Monster in the thrilling new drama, “Money Monster.” Photo by Atsushi Nishijima, courtesy © 2016 CTMG, Inc. Various solutions are pursued to bring the situation under control. Attempts at negotiation are initiated by New York Police Captain Marcus Powell (Giancarlo Esposito), and even Kyle’s pregnant girlfriend, Molly (Emily Meade), is brought in to try and reason with him. But, as this tense scenario unfolds, it gradually becomes apparent that there’s much more to this story than just a hostage taking, as becomes apparent when Camby suddenly resurfaces, setting up an end game that has to be seen to be believed. Why everybody? Because all of the characters in this multifaceted narrative have a role to play, they all contribute to its unfolding. In terms of conscious creation philosophy – the doctrine that maintains we manifest the reality we experience through the power of our thoughts, beliefs and intents – the story in “Money Monster” represents a jointly created mass event, one in which multiple parties partake in its materialization. And, of necessity, as conscious creators are well aware, with the act of creation comes the consequence of responsibility, something about which we must always be aware with whatever we manifest. So how are others besides Kyle responsible? Let’s start with Camby, who created the investment opportunity. By making this stock issuance available, he has a responsibility to his investors in terms of how he structures it and how he conducts the affairs of the company, which will have a bearing on the investment’s returns. Granted, he can’t control everything associated with the investment or with Ibis’s performance, but he has an obligation to act responsibly in handling the offering’s setup and the company’s operation. While on the air, disgruntled investor Kyle Budwell (Jack O’Connell, foreground) takes financial news show host Lee Gates (George Clooney, background) hostage as revenge for alleged bad investment advice in “Money Monster.” Photo by Atsushi Nishijima, courtesy © 2016 CTMG, Inc.
Then there’s Gates, who disseminates information about the investment and the company. As someone who shares this with the viewing public, he has a responsibility to make available the most accurate and authoritative information he can find. Because he has influence with his audience, he contributes to the formation of their beliefs, the actions they take and the reality they experience, a crucial consideration given that their savings are at stake. However, if he abrogates his responsibility by taking the lazy way out – such as by merely passing along company press release information instead of investigating the organization’s claims directly – he runs the risk of passing along spin in lieu of bona fide data, a potentially misleading approach that could seriously impact the financial well-being of his viewers. In turn, one could also argue that the investing public has its own responsibility. Failure to look into the stock issuer’s claims by merely following the recommendations of a cable TV guru (who may or may not have done his own homework) could be a potentially perilous path. Given that, then, would-be investors have a responsibility to themselves to investigate where they’re putting their money to avoid the possible pitfalls associated with slipshod scrutiny. Indeed, those who shirk their diligence had better be prepared for the consequences of their inaction (and the beliefs that inspire it). Kyle, of course, has responsibility for how he responds to the news of his investment’s collapse. As in the initiation of any conscious creation endeavor, he has multiple options available to him, from the one he implements here to the many other, less volatile possibilities he eschews. 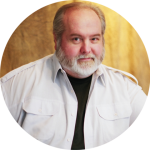 Each option carries consequences – some more disruptive than others – but he’s ultimately responsible for what results in each scenario, whichever one he chooses. Given how events play out in the film, some might suggest he should have considered another path, that getting revenge nearly always backfires. But then, in light of what incited him, some might also contend that he took the path he needed to take. Whichever course he pursues, however, he (like all of us) must be prepared to deal with the fallout, for better or worse. And then there’s the production staff, which also has a role to play in this scenario. By keeping the broadcast on the air, the Money Monster crew allows the world to view what’s transpiring, keeping the public informed, which some would say is a responsible act. But others might contend that maintaining the live feed carries such implications as inciting public unrest, inspiring copycat perpetrators and exploiting personal misfortune, all of which raise questions of propriety and carry potentially disastrous consequences. Finding a balance in circumstances like this may be challenging, but, no matter what the staff decides, they’re responsible for their actions and must be prepared for whatever comes from what they create. Flamboyant TV show host Lee Gates (George Clooney, center) presents the latest financial news with a variety of gimmicks, like an opening dance number, in “Money Monster.” Photo by Atsushi Nishijima, courtesy © 2016 CTMG, Inc.
Viewers play a part here, too, regardless of whether or not they’re investors in the financial products in question. They participate through their investment in their viewing choices. By tuning in to FNN’s “programming,” they contribute to the creation of what we collectively consider worthwhile and acceptable television, which, in turn, impacts our responses to such media content. That can lead to shifts in public attitudes about what we tolerate, what outrages us, what leaves us unfazed and so on, all of which are traceable back to us, since we all contribute to what gets created initially and what results from it subsequently. In sum, in all of these story elements (especially those related to finances), the film raises important questions about doing what’s right versus doing what’s legal. This is tricky territory, because the law may allow certain actions, even if they’re morally or ethically questionable. If one is uncertain how to proceed in situations like this, drawing upon the responsibility factor would be a prudent course to follow, especially in assessing potential consequences. Doing otherwise may prove calamitous, and that can be quite problematic (particularly when other people’s money is involved!). Some may argue that the foregoing observations stretch credibility, that it’s a bit much to contend that one manifestation links to all others. But, as conscious creators well know, everything is connected to everything else, regardless of how seemingly disparate “unrelated” elements of reality may superficially appear. Indeed, when we unwind the chain of connections, we see how they’re all joined to one another, in much the same way that quantum physics principles maintain that the inherently entangled atomic building blocks of existence are intrinsically linked. When we view reality from this perspective, it becomes difficult to take it – and the role we play in its manifestation – lightly, no matter how seemingly incidental we may believe our participation is. The next time you doubt that, think about this movie, and you may well reconsider your position before you act – or before you form the beliefs that lead to debatable actions. No matter how things play out, however, we can take comfort that we always have an opportunity to make amends for what happens, thanks to the concept of redemption. Given that conscious creation enables us to explore uncharted territory and to learn various life lessons, it also makes allowances for “mistakes,” the slip-ups that are part of our individual learning curves, including in matters of responsibility. While it would be ideal to forecast the consequences of our actions (and nail the beliefs that govern them) before engaging in them, sometimes we don’t assess such matters as effectively as we might, prompting missteps. However, we’re not without recourse in these circumstances; we’re always able to make up for our “errors,” enabling us to redeem ourselves and providing us with enlightened new outlooks. 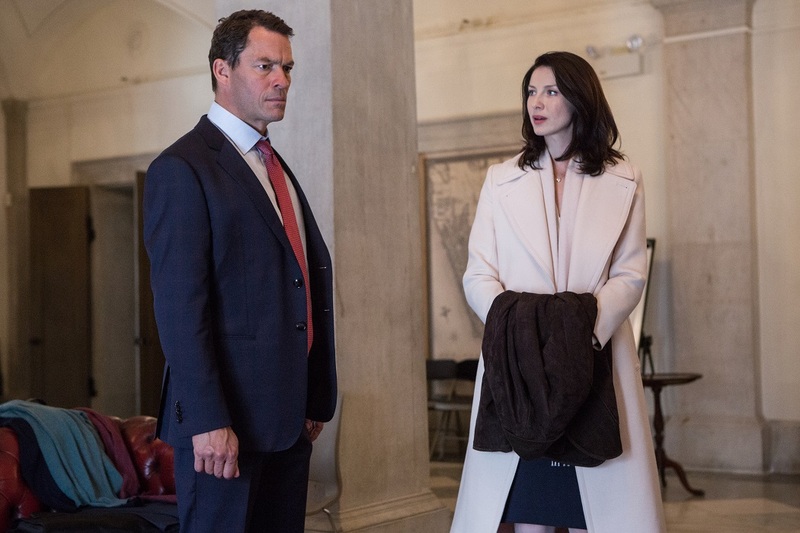 Walt Camby (Dominic West, left), founder of a financially troubled corporation, and Diane Lester (Caitriona Balfe, right), the company’s chief communications officer, go into damage control mode when bad news about the organization goes public in “Money Monster.” Photo by Atsushi Nishijima, courtesy © 2016 CTMG, Inc. 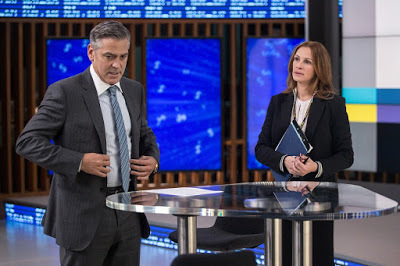 Though the plot is occasionally somewhat implausible, “Money Monster” is a genuinely taut thriller that consistently entertains and never disappoints. Filmmaker Jodie Foster has delivered her best directorial work here, with a nicely paced, well-acted, edge-of-the-seat offering that includes just the right touches of social commentary, satirical cynicism, comic relief and lessons in responsibility. Clooney, Roberts and (especially) O’Connell turn in excellent performances in bringing this showstopper to life. 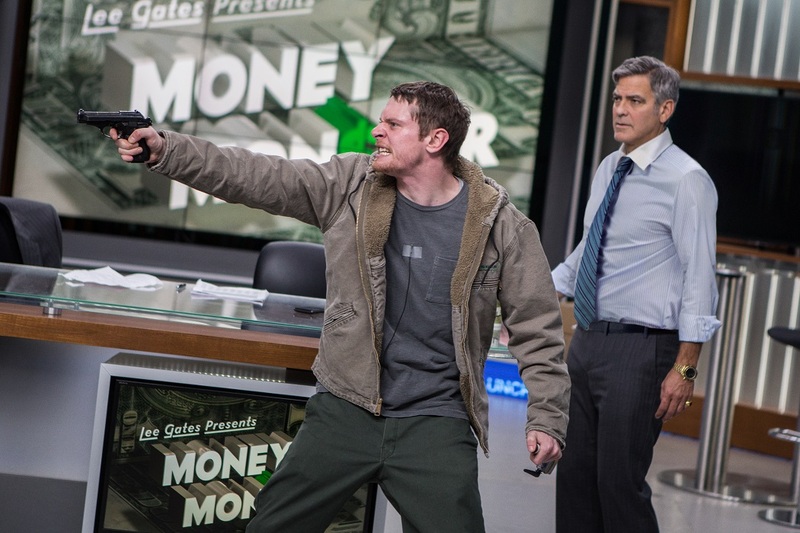 Interestingly, “Money Monster” pays homage to a number of cinematic predecessors, either in terms of subject matter or the manner in which certain actions are portrayed. From a financial standpoint, for example, viewers will recognize elements and themes reminiscent of “The Big Short” (2015), “99 Homes” (2015) and “Wall Street” (1987). Similarly, in matters of media coverage of hostage situations, the film recalls such releases as “The China Syndrome” (1979), “Mad City” (1997) and “Kings and Desperate Men” (1981). The viewing public’s fascination with this picture’s version of reality TV echoes elements seen in “The Truman Show” (1998). And Kyle’s impassioned rants call to mind the ravings of delusional anchorman Howard Beale in “Network” (1976). 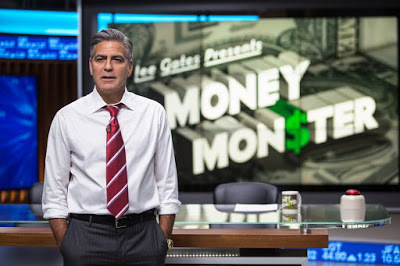 But, in paying tribute to its influences, “Money Monster” is careful to reference them, though not to blatantly copy them, a fitting and skillfully handled approach. Taking responsibility into account in our manifestation ventures may be seen by some as a chore, especially if it involves hard work and carries the potential for consequences we’d rather ignore. But putting in the effort on this up front often proves more manageable than having to mop up an unforeseen mess afterward. An ounce of prevention truly has metaphysical implications, and, in the end, it’s much easier to handle than that proverbial pound of cure.